Trucks… cars on steroids or society’s workhorses? 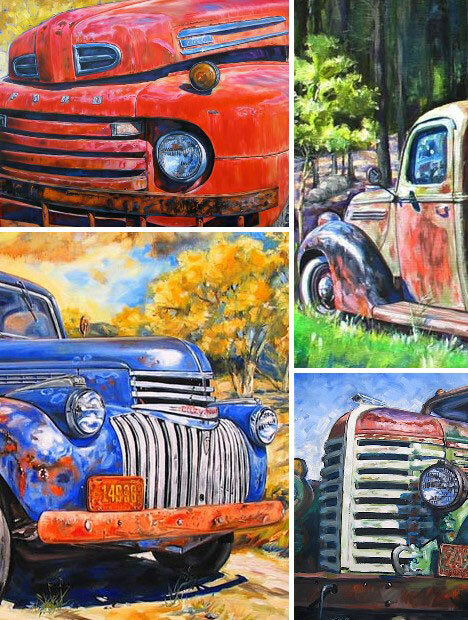 Trucks are cool fresh off the assembly line but such huge, mobile canvasses just naturally invite artists to add to their awesomeness. 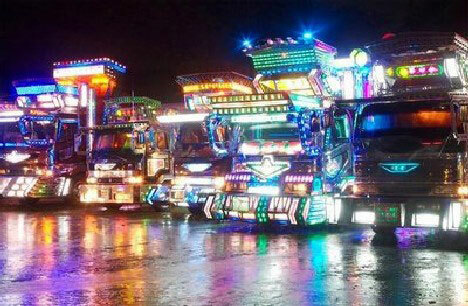 Here are 15 examples of awesome art made for, with and upon trucks. 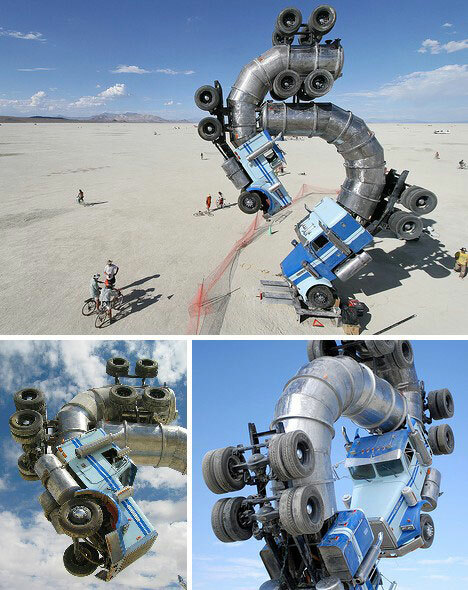 One of the visual highlights of Burning Man 2007 was the Big Rig Jig, a dynamic super-sculpture comprised of two retired oil tanker trucks. Designed by Brooklyn artist Mike Ross in collaboration with a crew of artists from American Steel in Oakland, CA. The massive monument was meant to evoke humankind’s co-dependent relationship with the oil industry while hinting at our ability to change things for the better. 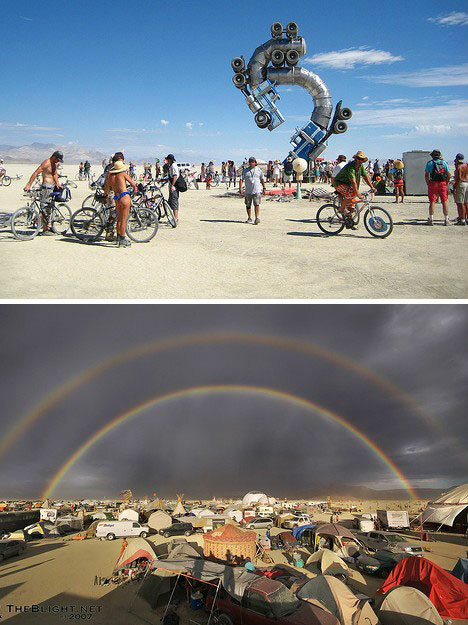 Above is another view of Big Rig Jig at Burning Man 2007 and just below it, a remarkable photo of a rare double rainbow captured after a sudden storm in Nevada’s Black Rock Desert. Got big faith? Put it on your truck! 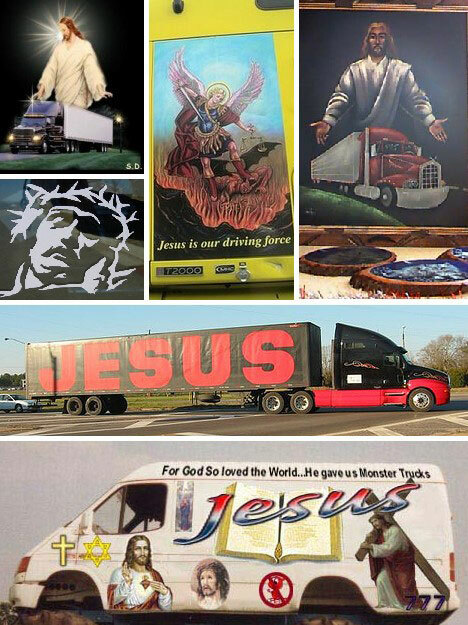 From their use as mobile billboards to personal declarations of one’s heartfelt faith, truck art featuring Our Lord and Savior is more common than you’d think. Some of these mobile murals are almost humorously amateurish yet others are, well, mind-boggling. 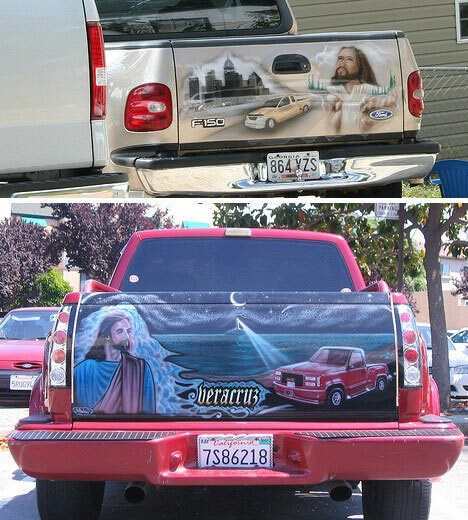 These 2 examples of faith-based truck art rule on several levels, mainly by being paintings of the owners’ trucks, ON their trucks, being admired by Jesus. Amen, brothers and sisters! 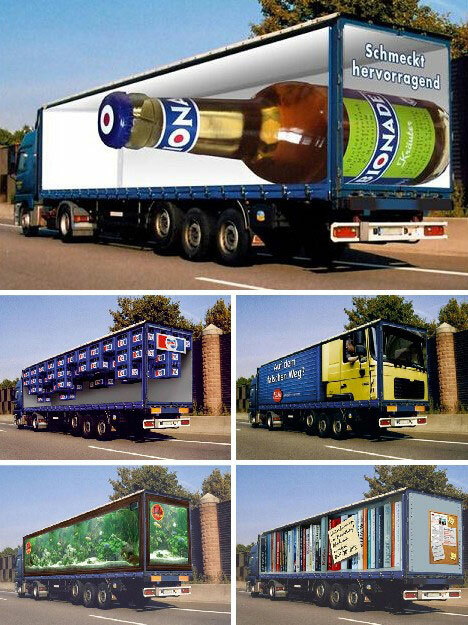 These images of trompe l’oeil advertising on the sides of 18-wheelers have made the rounds online for the past few years but as cool as they might look, they’re not actually real. Instead, they’re designs submitted by a German advertising agency to the 2005 Rhino Awards. The proposed “RollAd” campaign would see actual semi’s touring the autobahnen, promoting products and distracting other drivers. In This Corner, The Yonkers Chomper! Nothing beautiful about garbage trucks, you say? 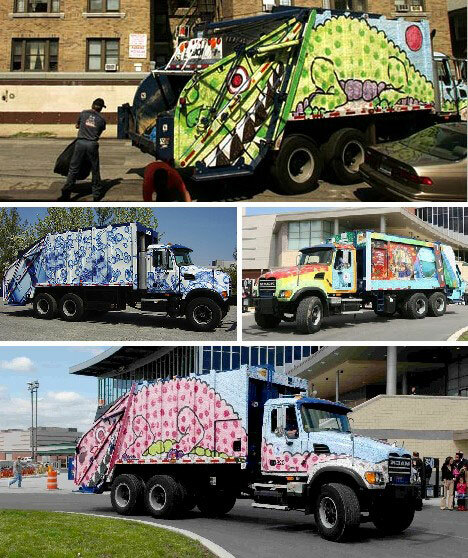 Think again – the City of Yonkers commissioned six Department of Public Works’ garbage trucks to be transformed into art trucks through the application of bumper to bumper vinyl wraps. The result is mobile art with a lot of eye appeal… now if they only could do the same for our noses. 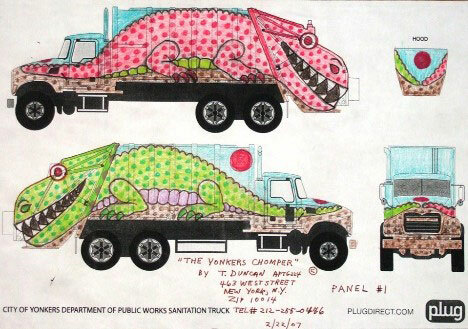 Above is New York City artist Tom Duncan’s original design for the Yonkers Chomper. Dino-might! What would the west coast be without hundreds of often brightly decorated taco trucks offering up delicious Tex-Mex treats? 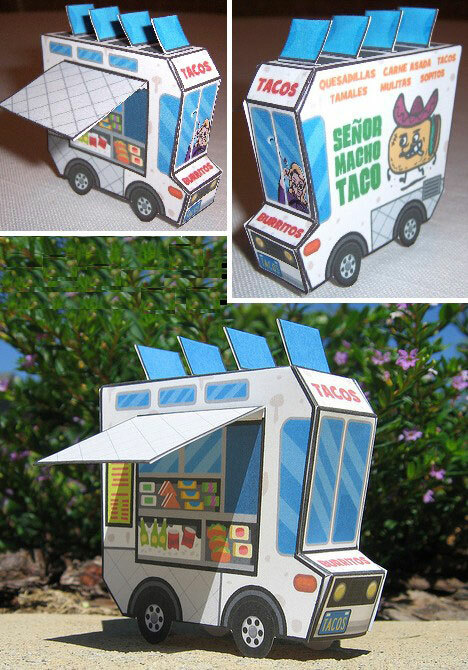 Less “tasteful”, certainly – but at least we’d have this papercraft labor of love from Misguided Designs to ease the pain (if not our appetites). 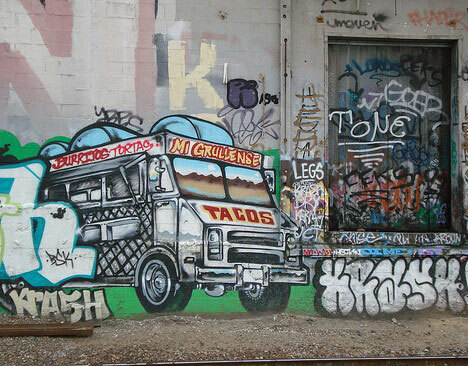 Even urban graffiti artists recognize the special place taco trucks hold in California culture. Here’s an example, featuring a well-loved East Oakland taco truck that instead of displaying art, has become it. 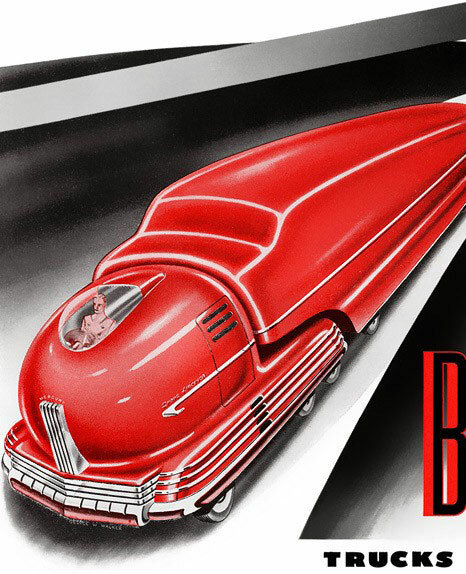 Tough, powerful, big and macho – the traditional imagery of trucks and trucking companies comes through best, some might say, in the bold and colorful graphic style popular in the Forties and Fifties. The above selection presents trucks in a very flattering light indeed. 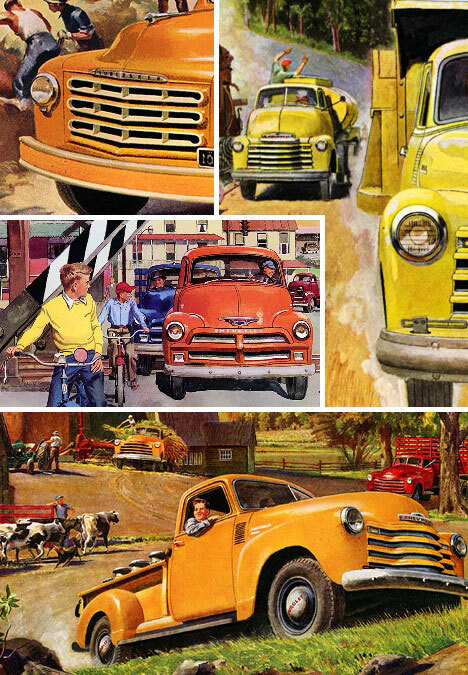 Trucks of the future also look best when drawn from the perspective of the past, as the selection above so graphically illustrates. Decotora, pidgin Japanese for “decorated truck”, brings trucks to their full potential artistically. As documented over the span of a decade by Masaru Tatsuki, decotora can be somewhat shocking upon first impression, especially after dark: imagine a hunk of neon Tokyo skyline suddenly rev up and start rolling down the highway! 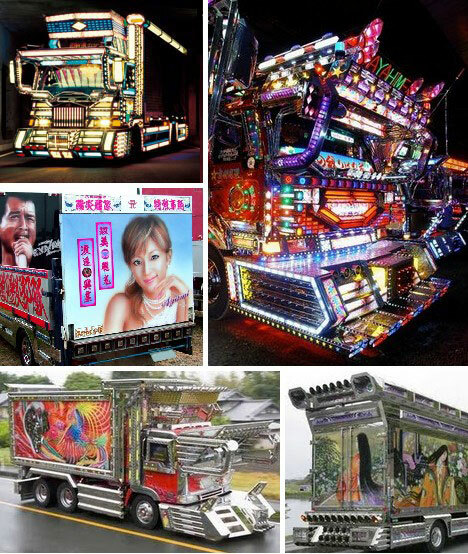 Though less well known than Pakistani truck art, Japanese decotora makes its mark by going even further by employing paint, accessory lighting and sheet metal mods. 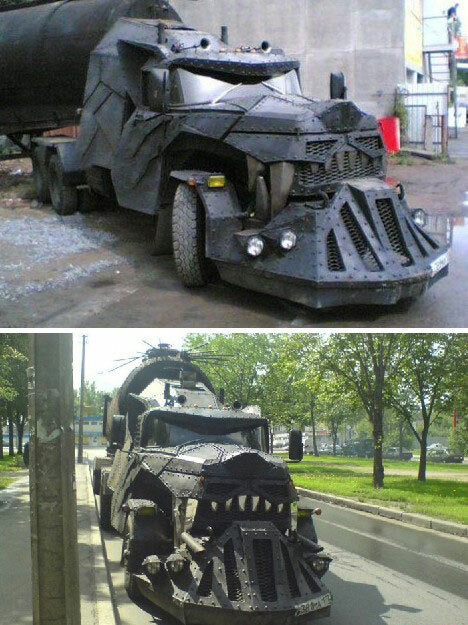 In Russia, Truck Drive YOU! Drive you crazy with fear or drive you into gales of laughter? Maybe both, since this is Russia we’re talking about and one must expect the unexpected… like the Dragon Tank Truck shown above. 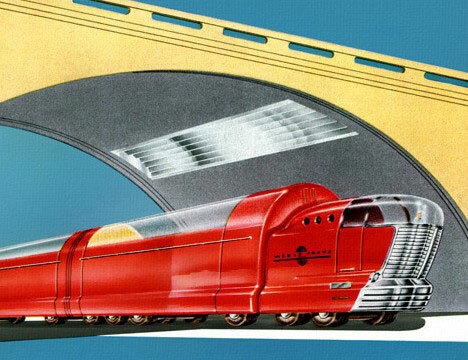 Imagine having this beast roar down on you while trudging along some lonely trans-Siberian rural route. 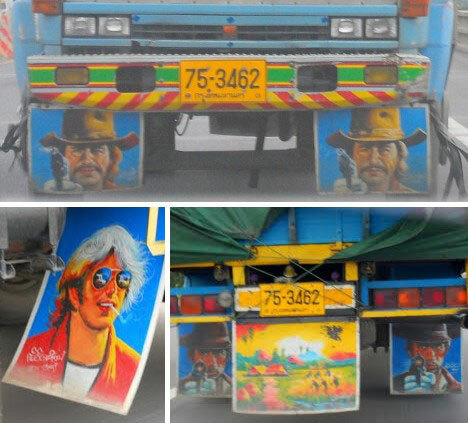 Thailand’s truckers love to show off their art, though much of it seems to be confined to banner-like mudflaps. Drive too slow in front of the trucker at above top and you’d have to have a Death Wish or something. Back in the USA, truck mod art is often more about the art than the mod. Take these graffiti artworks applied onto various trucks – with or without permission. What would really be impressive would be if the artists composed their works while the trucks were in motion. Or perhaps in pieces? Either way, Colorado artist Lee Reedy captures the essence of his subject matter, in this case Vintage Tin. Natural weathering under clear mountain sunlight brings out colors in truck paint that would surprise the original stylists back in Detroit, but pleases and delights most everyone else. 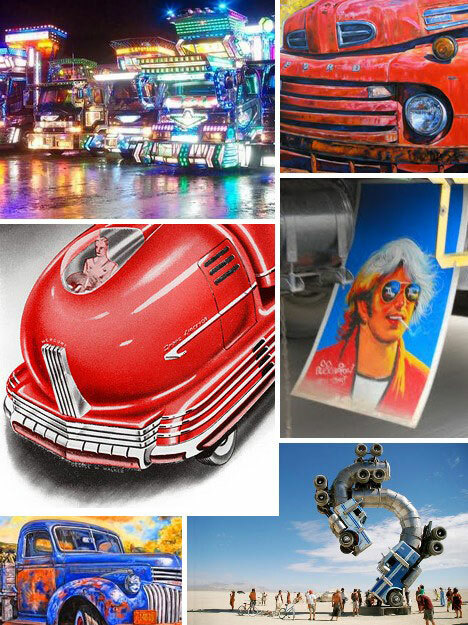 “The Art Truck Bed By Patrick Amiot – A Great Place to Crash”. 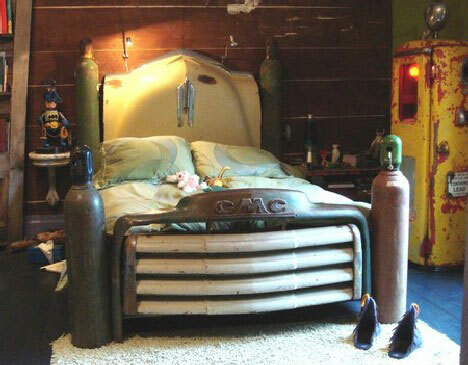 I wish I had said that but at least I can post this closing image of a bed made from a deconstructed GMC pickup truck – more or less. Found items artists Patrick Amiot and Brigitte Laurent added a refurbished and upcycled vintage gas pump to add a little extra fuel to the fire. What is it about trucks that motivates so many owners to let loose their inner artist? Maybe it’s the utilitarian nature of the beasts; so out of sync with basic human wants and desires. Regardless, what once was bland, now is grand. Roll ’em!